The MW89MST from Samsung is a stylish and sleek black and silver microwave, with an impressive 23 litre capacity and 29cm turntable. Spacious interior, and a stylish exterior - what's not to like?! It performs very well too! We didn't experience any issues with this model - our test team really liked it! 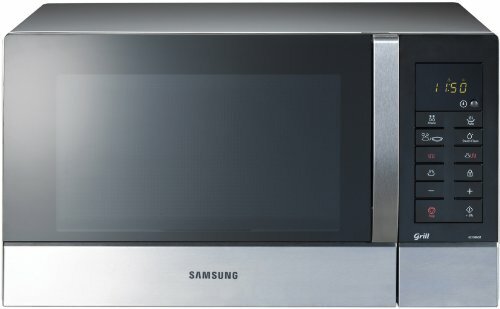 Looking to buy a designer looking solo microwave for your kitchen? The MW89MST from Samsung is well worth considering, with a modern yet minimalist design, and a spacious 23 litre capacity complete with handy 29cm removable turntable. The controls, situated to the right hand side of the appliance, provide an easy and simple method of operating the microwave, with none of our testers finding any issues - they're large and well labelled for easy usage. In terms of power, the Samsung MW89MST is not lacking - with a top output of 850w, with 6 power levels in total for flexibility. Overall weight is 13 kg, and inside you'll find a 29cm turntable. Externally it measures 38.5cm by 48.9cm by 27.5cm, which should fit comfortably on the majority of kitchen work surfaces. We tested the Samsung MW89MST for a number of weeks, and could not fault it. Granted, it doesn't feature a grill opr combination oven, and so is only really suitable for heating, cooking and defrosting food, but what it does, it does very well indeed. Our tester were very impressed with both the build quality and performance of the MW89MST. So who should buy this microwave? The clean lines of this microwave impressed our testers, with it ideally suited to a modern style kitchen. It's large enough inside to accommodate most dishes, and as a result is pretty versatile. 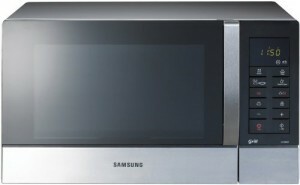 If you're looking to buy a stylish mid sized solo microwave, then the Samsung MW89MST comes highly recommended!